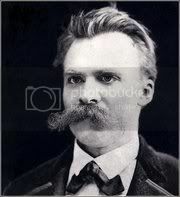 Nietzsche* wasn’t exactly a model of lightheartedness. He eventually succumbed to incapacitating mental illness, which some believe to have been part-inspired by his radical philosophies and relentless questioning of ‘truth’. Even so, he had some profound things to say about being happy. – He famously proclaimed ‘the death of God’. But rather than face a meaningless, faithless existence he proposed a life-affirming embrace of the here and now by a sheer effort of will and imagination. – He believed there are no facts, ‘only interpretations’. – He disagreed with Mill’s Utilitarianism, where, to be happy, you do what gives pleasure and avoid what causes pain. By contrast, Nietzsche thought happiness was more hard won, sometimes needing us to suffer for our sense of fulfillment – as with creating art, for example. Meaning: Nietzsche’s ideas are radical, confronting and not for everyone. But if we choose to, we can each in our small way create a life story in which we are the hero. We can work on our character and our choices to transcend limiting expectations and beliefs, and rise above the apparent chaos and meaninglessness of life. Interpretation: There are innumerable perspectives for viewing the world – and no consensus on the right one. So we might as well choose to see things in a way that helps us to be happy – to recognize kindness in people, joy in small things, and a bright outcome in even the crappiest situation. A darker outlook is no more ‘true’. Suffering: A little pain is a small price to pay for a more fulfilling, happy life. Whether it means the effort of study for a better job, sacrificing a holiday today for a home tomorrow, or exercising to enjoy a longer, more comfortable life, we can open ourselves to a bigger, more complex picture of pleasure and happiness. Nietzsche’s post-modern, existential take on life can at times seem bleak. But at heart it’s life affirming – a call to each of us to see the world, our pain and our place in the universe in a proactive and heroic way. And in this way, to find our own happiness. Read more philosophers ‘On Happiness’. *To learn more about Nietzsche, you might like to read The Passion of the Western Mind: Understanding the Ideas that Have Shaped Our World View by Richard Tarnas.